Gram-positive bacterial infection drugs act against gram-positive bacterial infections such as MRSA infections, sinusitis, and pneumonia. Gram-positive bacteria are those class of bacteria that retain gram stain and hence, are observed as violet purple colored stains when observed under the microscope. They are a major class of bacteria that cause various infections in humans. These drugs act by various mechanisms such as inhibition of cell wall synthesis, inhibition of protein biosynthesis, and inhibition of DNA replication. The global gram-positive bacterial infections market was valued at around US $ 51,450 Mn in 2017. It is expected to expand at a CAGR of 1.5% from 2018 to 2026. The market for gram-positive bacterial infections is expanding significantly, owing to an increase in the number of cases of gram-positive bacterial infections and a rapid rise in antibacterial resistance. Increased government initiatives and funding for R&D activities & newer bacterial infection treatment and infection control in healthcare settings is also a key factors driving the market globally. The gram-positive bacterial infections market has been segmented based on drug type, disease, route of administration, distribution channel, and region. Based on drug type, the global market is classified into antibiotic, antifungal, and others. The antibiotic segment has been further sub-segmented into B-lactam, quinolones, macrolides, tetracyclines, aminoglycosides, sulfonamides, phenicols, and others. The antibiotic segment dominated the global market and is expected to maintain its position during the forecast period owing to better efficacy in treatment of wide spectrum of bacterial infections and development of novel approaches for new antibiotics. The others segment, which includes antitoxins, corticosteroids, supplements, anti-dialectic, calcium, probiotics, is expected to expand at a higher CAGR during the forecast period owing to the popularity of combination drugs prescribed for patients who are more prone to the adverse effects of single antibiotic prescription. Based on disease, the global gram-positive bacterial infections market has been divided into MRSA, pneumonia, sepsis, sinusitis, cellulitis, otitis, pharyngitis, impetigo, and others. The sinusitis segment is dominant owing to the rise in prevalence of sinusitis and increased usage of antibiotics for this infection. The otitis segment is projected to expand at a higher CAGR during the forecast period due to a rise in the prevalence of otitis media and the efficacy and safety of antibacterial agents to cure the infection. In terms of route of administration, the global gram-positive bacterial infections market has been classified into enteral, parenteral and others. The enteral segment dominated the market global market. Patient preference, ease of administration and ability to achieve desired therapeutic concentration are some factors driving the enteral segment. Based on distribution channel, the global gram-positive bacterial infections market has been segregated into hospital pharmacies, drug stores and retail pharmacies, and others. The others segment, which consist of online pharmacies and mail pharmacies, is projected to expand at a notably higher CAGR. This expanded CAGR is attributed to better discounted rates on drug purchase and convenience offered by online pharmacies. In terms of region, the global gram-positive bacterial infections market has been divided into North America, Europe, Asia Pacific, Latin America, and Middle East & Africa. North America dominated the global gram-positive bacterial infections market in 2017, owing to a rise in the prevalence of bacterial infections, better diagnosis and treatment rate, and presence of major players in the region. Asia Pacific is a lucrative market for gram-positive bacterial infections, and the market is estimated to expand at a prominent CAGR during the forecast period due to larger patient pool and rising number of infected cases in the region. Key players operating in the global Gram-Positive Bacterial Infections market include Bayer AG, Pfizer, Inc., Sanofi, GlaxoSmithkline plc (GSK), Merck & Co., Inc., AstraZeneca, Theravance Biopharma, Bristol-Myers Squibb Company, Novartis AG, and Allergan plc. Bacterial infections are a major cause of illness and are generally acquired through various sources. Based on staining, bacteria are classified into two types: gram-positive and gram-negative. Gram-positive bacteria retain gram stain and hence, are observed as violet purple colored stains when observed under the microscope. They are a major class of bacteria and cause various infections in humans. Gram-positive bacterial infections drugs act against gram-positive bacterial infections such as MRSA infections, sinusitis, cellulitis, and pneumonia. Antibiotics are widely used as the first line of treatment for these infections. Antibacterial resistance is considered to be a serious threat in this century for the treatment of bacterial infections. The market for gram-positive bacterial infections is expanding significantly due to a rise in the number of cases of bacterial infections and rapid increase in antibacterial resistance. Furthermore, infection control in healthcare settings and increasing government initiatives & funding for R&D activities have fuelled the gram-positive bacterial infections market. The gram-positive bacterial infections market has been exclusively analyzed based on drug type, disease, route of administration, distribution channel, and region. Based on drug type, the global market has been divided into antibiotic, antifungal and others. The antibiotic segment has been further sub-segmented into B-Lactam, quinolones, macrolides, tetracyclines, aminoglycosides, sulfonamides, phenicols, and others. In terms of disease, the global gram-positive bacterial infections market has been segmented into MRSA, pneumonia, sepsis, sinusitis, cellulitis, otitis, pharyngitis, impetigo, and others. Based on route of administration, the global market has been classified into enteral, parenteral, and others. Based on distribution channel, the global gram-positive bacterial infections market has been split into hospital pharmacies, drug stores and retail pharmacies, and others. Each of the segments has been analyzed in detail for market trends, recent trends and developments, drivers, restraints, opportunities and useful insights. The report gives current and future market size for each segment and sub segments for the period from 2018 to 2026 in terms of revenue in US$ Mn, considering 2017 as the base year. The compound annual growth rate (%CAGR) has been provided for each segment and market for the period of 2018 to 2026 with market size estimations. In terms of region, the global market has been segregated into North America, Europe, Asia Pacific, Latin America, and Middle East & Africa. The regions have been further sub-segmented into major countries and sub-regions. The current and future market sizes in terms of revenue (US$ Mn) of these regional markets and their major countries have been provided in the report for the period from 2016 to 2026, with their growth rate (%) for the period from 2018 to 2026. The study also offers a list of recommendations, highlights and some useful insights of the market which will surely help new companies willing to enter the market and for existing companies to increase market shares, which is likely to help in the decision-making process. 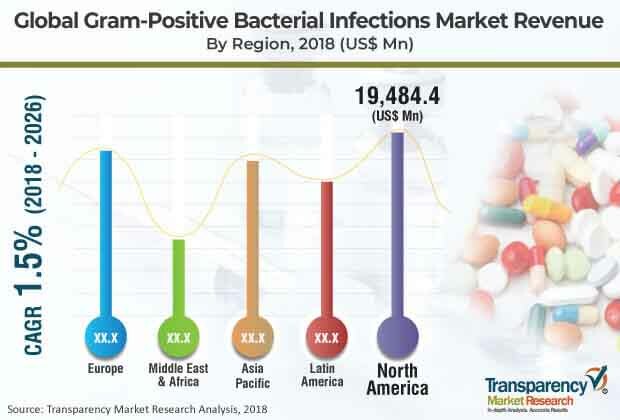 The market overview section of the report demonstrates the market dynamics and market trends such as drivers, restraints and opportunities that influence the current and future status of the gram-positive bacterial infections market. The report also covers market revenue projections, market attractiveness analysis and key market share analysis in the market overview section in order to provide a thorough analysis of the overall competitive scenario in the global gram-positive bacterial infections market. The report concludes with the company profiles section that includes key information about the major players in the market. Key players identified in this report are Bayer AG, Pfizer, Inc., Sanofi, GlaxoSmithkline plc (GSK), Merck & Co., Inc., AstraZeneca, Theravance Biopharma, Bristol-Myers Squibb Company, Novartis AG, and Allergan plc. Each of these players has been profiled in the report based on parameters such as company overview, financial overview, business strategies, product portfolio, Business segments and recent developments.